I love finding new ideas. And especially new ideas that make my life more organized. And simple. 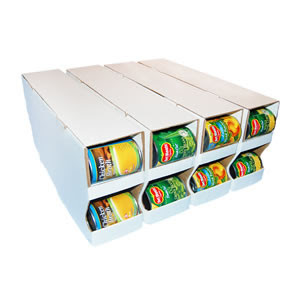 If you have a kitchen, and those kitchen cupboards are filled with canned food, you’re going to instantly fall in love with the Can Organizer. This company has designed a very affordable way to customize your kitchen cupboards, your pantry, or your extra canned food storage down in the basement. 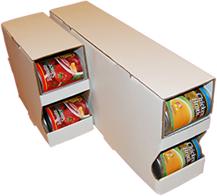 Can Organizer has created a very simple, yet precise design that allows you to maximize cupboard space, while making each of your cans accessible. And better yet, as you take the first can out, the ones behind it roll right to the front. And because Can Organizer understands that we store our cans in all sorts of locations, they have different sized organizers. 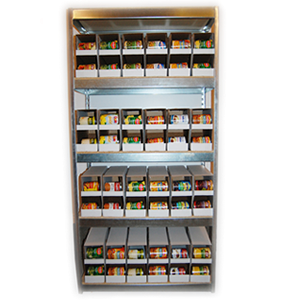 The Cupboard Organizer, found here is more shallow and fits nicely right in your kitchen cupboards. And yes, fits those standard food cans just perfectly. You can simply use one of the organizers, or several in a row. Whatever your cupboard space allows. And then fill up that whole cupboard…………..and all of your cans are ready to be used. 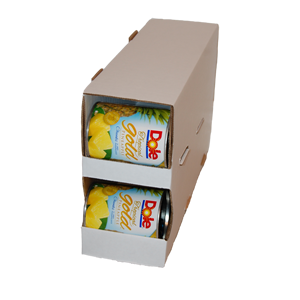 The Shelf Organizer, found here, fits the same standard cans but is a bit deeper…….allowing you to stash more cans in each organizer. Perfect way to maximize all of that shelf space. And here they are, sitting nicely together. And then onto the Pantry Organizer, found here. This organizer is the deepest one they carry, and extends 22.5 inches deep. Perfect for those bigger pantries or shelves down in the basement. 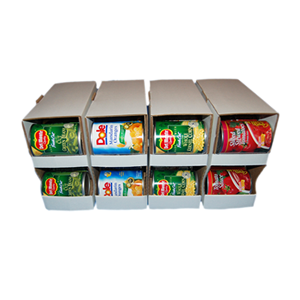 Now you can buy all of those cans of food that are on sale at the grocery store and have a better place to store them all. Love that. And if your cupboards are crammed with this and that and you don’t have space to fit several organizers in a row, customize what you need and use different sized organizers for the space that you have. Aren’t you ready to spruce up those cupboards? And start stashing away extra cans that you found on sale last week? What a great way to calm the craziness of those messy cupboards. And yes, Can Organizer has offered a fantastic giveaway to one of you readers. 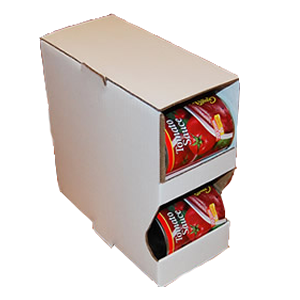 They are offering a 4 pack of can organizers, of any size. edit: And if you aren’t feeling lucky, or end up not winning the giveaway, Can Organizer is offering a 10% discount off any purchase (limit one order per customer). Just put in the code ‘make it love it‘ at checkout. Visit Can Organizer here, check out the site and browse around for a bit, and then choose your very favorite item(s) over on the site. Then come back and let me know what you like, in one comment. I love this idea!!! 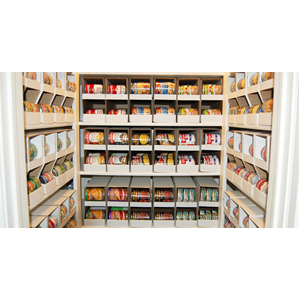 I love the pantry organizers…I have built in cabinets in my basement for food storage, and have never found a way to organize thise can so they can be easily rotated!! GENIOUS!!! I love the shelf and pantry organizers! Win or lose this giveaway, I am getting some of these!! Amazing giveaway! This is exactly what I need! I love the pantry and shelf organizers! What a great idea!!! My pantry is an absolute mess and these would definitely help! I love the deeper sized pantry organizer! The shelf organizer is great with the double levels! These are awesome! I love the pantry organizers. Exactly what I need! OMG! This is incredible– we have 6 kids, and after losing our house from being laid-off, we went from a butler's pantry to a tiny kitchen closet all of about 2×3' The entire bottom of the pantry is nothing but a bunch of disheveled can toppling, because the wire shelves cant hold the weight, and every time we go for a can we knock more down…. If i HAD to choose… I love the cupboard organizer 4 pack, but I love the idea! This would so help out for those times I stock up on canned items! OH I love this! I have one teeny cabinet for canned foods and I nearly injure myself moving them around to find something because I have to stack them. And um, you might be a crafter if the first thing you think of is "Oh how cute would those be with some mod-podged scrapbook paper on them!" Love the shelf organizers! They look like the perfect solution! I love these. We just bought a new house and are in desperate need of organizing our food storage room. This is a very inexpensive way to do it. I love it! I love the cupboard organizers. Ours is a complete disaster with all the cans of spaghetti o's and tomato sauces/diced/pastes… ugh. May have to purchase if I get this give away or not!! The shelf and pantry organizers are fantastic. Sure would keep things neater in my pantry. What a great idea. I could use some of these. My can goods are a mess. I like the pantry organizers. This is just what I need. I hate rotating every time I come back from the grocery store. I would pick the shelf or pantry organizers. Thanks for the chance to win! Brilliant! I thought I was being clever building an extra-deep pantry only to discover I can't find anything! (lesson learned…) So that deep pantry version would be spot on. Thank you for the chance! I like the pantry organizer. We have a smaller amount of storage in our home, and that would be a great way to utilize space! This is so great! I love the pantry organizers- that is exactly what we need! We just began our long-term storage plan and the organization gets a little frustrating at times. I love the Cupboard Organizers! I always have problems finding what i need …this would be a perfect solution! PERFECT! FInally, a lower price alternative that still does the trick beautifully. AWESOME site. Definately bookmarking that one. THANKS! That is awesome! The one that fits in a standard shelf is awesome! I already have huge home-made wooden ones in my food storage! I love the shelf organizers! We are in an apartment and the kitchens aren't amazingly big so this would be great! This is exactly what my pantry needs! The organizers are brilliant! Pantry organizers, all the way! Thanks for the opportunity! The cupboard organizer is the thing for me. What a fantastic way to (finally) organize my soups!! Love those pantry organizers! My pantry is tiny and that is such an efficient way to maximize the space! Of course my favorite is the shelf organizers! It is a great alternative to those pricey plastic/metal shelves. I love the pantry organizer because that is where I need the most help. I am just starting to organize my pantry!!! This would be a great assest for our family!! Awesome!! I love the pantry deep size organizers. I don't have a pantry, and so I end up having a pretty stash of cans in the cupboard that are occasionally organized, but mostly not! This would be great! I think I could fit the medium sized one for sure. My favorite is the pantry organizer! Love that these come in so many sizes. I need the larger sizes for my cream soups but I only would need the smaller ones for things like cranberry sauce. I agree…anything that makes things more organized is great! The cupboard organizer would be so nice! I think the shelf organizer would fit in our pantry quite nicely. I love that they're cardboard…I can see myself modpodging pretty paper on them already. How ingenious! I love this product. We converted a nook into a pantry and would LOVE the pantry sized organizers! Just awesome! fantastic! those would save me a lot of space in my storage room! I have never heard of this!!! And put it on my christmas list!! How amazing! I love their pantry organizers, my pantry needs it! 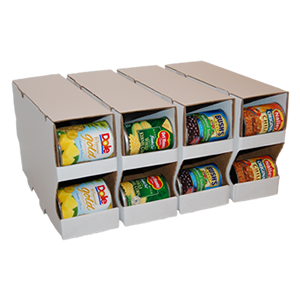 I think those shelf organizers would work for us–and no more cans falling on my feet. I love that they have them separate. That way you can get as many across as you want. Not like the predetermined sizes you can get at the stores. I love the shelf organizers! This is exactly what I need. I didn't even realize it's perfect to make sure you can rotate your food as well. I would love the cupboard organizer. I'd LOVE the shelf organizers. We need some organization to our food storage! I would go with the pantry organizer. I like the cupboard organizer. Those pantry organizers are brilliant! Plus, I already have an itching desire to mod podge them, or let my kids paint them or something:) Thanks for the giveaway! The shelf organizer is the ideal depth for my pantry. What a great way to straighten up that messy shelf! I love the pantry organizers! so helpful in containing the cans. I love the shelf pantry organizer. I just love the word ORGANIZER. Oh I feel calm already-!! I love how deep those pantry organizers are! So perfect! I've been thinking about how I can organize all of my coupon finds better… this would be perfect! I think my first choice would be the pantry organizer. Here's hoping! With a deep pantry, I like the pantry size. It's a great idea! This is exactly what I need for my food storage! What a great idea. The shelf organizers would work perfectly! What a cool idea! I love the shelf organizer. Such a great idea! My pantry could really use some of these! I love the pantry size organizer pack for all those cans. Oh, man! I am going to have to get some of these. I just packed my storage room full of case lots and I could save a lot of space with those organizers! Genious! I love the ones that go in your kitchen cupboards. I need these! The shelf and pantry organizers would be great for my deep shelves. These are definitely going on my Christmas list! I love the new pantry organizers. Very great idea – and not too expensive! Love it. I think the shelf organizers would be the best size for me, although the pantry ones might work well in the basement! I've been to their site a few times lately… wishing I could get some of their organizers (ironically my budget doesn't fit BOTH canned food AND canned organizers. Alas). I really want some of their shelf organizers! These are awesome! I could use the pantry organizers! My cans are always falling over! Love it! brilliant! I love the pantry organizers! I want some! I love the pantry orginizers! WAY AWESOME! Win or loose i will be getting these! I love this and it is so affordable compared to the other systems I've seen! I would definitely get a pack of the shelf organizers. I LOVE THESE!!! I am always looking for ways to be better organized. I love the deep pantry organizers! Awesome idea!! I need these shelf organizers! I like the pantry organizers. Thanks for the opportunity to win this giveaway! ooohhh… the cupboard organizer would be perfect… I love that they are so affordable too! FUN! I want the pantry organizers! I love the cupboard organizers! They would fit perfectly in my pantry (the shelves aren't so deep). Awesome giveaway, thanks!! I love them all, its brilliant! I could definately use some pantry orangizers!!! I'm not sure where I found these (I think they sponsor another blog I read or something). Anyway, I've had these bookmarked for a while now. I love how inexpensive they are! I'd pick the pantry size. Oh I love the cupboard organizers! What an awesome way to maximize and utilize your space! And they are very affordable too! Very clever design! Love it. I would go for the shelf organizers, I have a few spots for them. Thank you! I love the deep pantry organizers. I have really deep shelves that never get their full use. This would be great! I love the shelf organizers! Wonderful product! I NEED those cupboard organizers. My cupboards are a mess. Awesome giveaway! Thanks. Great giveaway! Love this idea! i would love the pantry shelf organizers! What a great idea. I have my cans stacked in the pantry and they are always falling over. I definitely would choose the pantry organizers. Awesome idea! 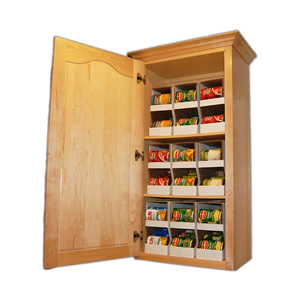 I love the pantry organizers and will definitely be getting some when we move into our new house! Great giveaway!